We had a rocking call earlier this week with our clients, with surprisingly strong attendance and participation for being in the thick of tax season. One of the primary points of discussion was: how do you maintain excellence and focus when the bullets are flying? 1) Remember that YOU are the only one who is staying up at night thinking about your P/L. As such, you need to maintain your focus by delegating and distributing as much “hourly” work as possible. It hurts in the beginning — and, perhaps, especially so in tax season — but the payoff comes when you are able to focus like a laserbeam on high-leverage activities (promotions, joint ventures, PR, top client development, etc.). 2) Communicate with clarity to your staff and contractors. A good rule of thumb is that whatever you communicate to your staff, must be done in multiple media (email, skpe, in-person, internal memos) and more than once. As with effective marketing, a multi-step approach will get you the greatest results. 3) Ensure that your phone is being handled with excellence and clear goals for every phone call. This is such a critical component to your success that you cannot afford to “set it and forget it”. In fact, we’ll be zeroing in on this topic in our next month’s coaching call for clients. I’m actually going to “play prospect” for a select number of our clients, record the call, and we’ll analyze it together to ensure that every inbound call (or email, for that matter) is being handled right. * The goal for EVERY call is to get them in the door. This is done by presenting TWO options for every caller to come in and meet with someone on your staff. That way the question is a “Yes or Yes” question, which will be discussed further during next month’s call. 4) Leverage PR NOW because reporters are hungry for a local angle to the tax issue. Press releases are a powerful marketing tool and should be FAXED to local papers and tv stations for maximum impact, as well as submitted to online directories, etc. Make sure you have the time to execute these “owner level” tasks. If you don’t, fix that one right now. I read every email sent my way. 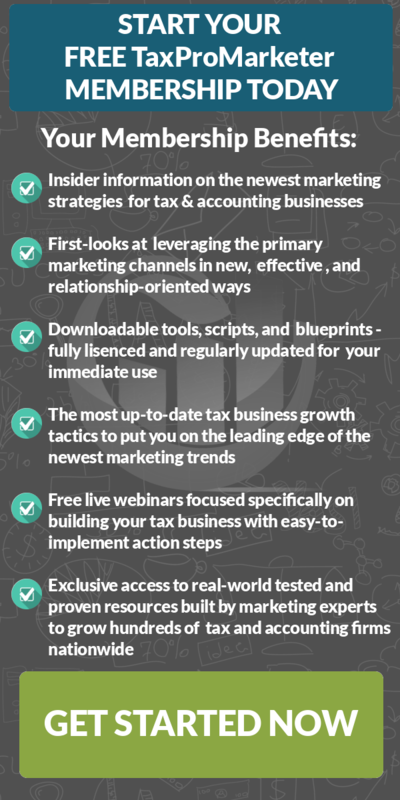 Copyright © 2007 – 2019 TaxProMarketer | Relational Marketing for Accountants & Tax Firms. Which does your business need?